Footage shows Istanbul airport attacker Jump to media player Turkey is observing a national day of mourning after a gun and suicide bomb attack killed 41 people at Istanbul's Ataturk airport on Tuesday. 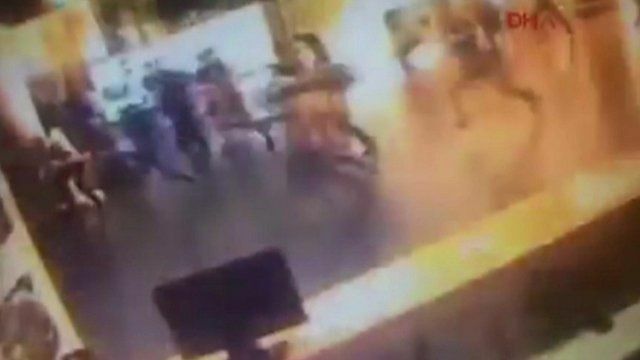 CCTV footage shows Istanbul blast Jump to media player Turkish investigators are examining video footage after three suicide bombers attacked Istanbul's main airport, killing at least 41 people. Istanbul attack: 'We all started to hide' Jump to media player A passenger at Istanbul's Ataturk airport during yesterday attack has described the "chaos" when the shooting and explosions began. 'Shattered glass, blood on the ground' Jump to media player Reporter Hugh Sykes describes the scene as he walks through Istanbul airport following a gun and bomb attack. CCTV footage has emerged showing one of the attackers at Istanbul's Ataturk airport. Turkey is observing a national day of mourning after a gun and suicide bomb attack at the airport killed at least 41 people on Tuesday. Mark Lowen reports from Istanbul.